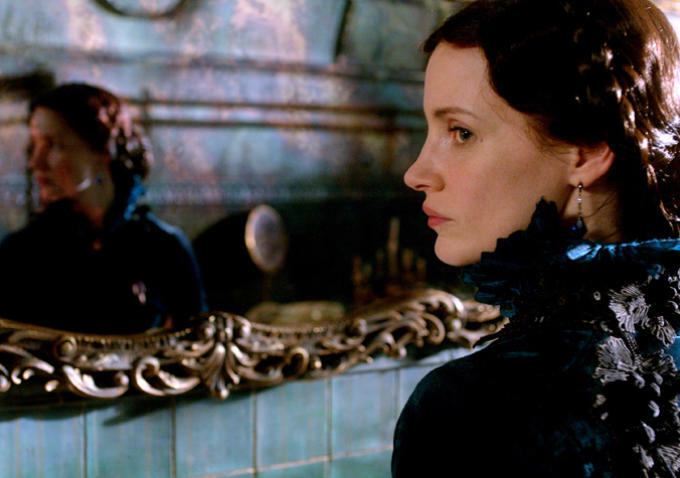 Guillermo del Toro insists that his newest effort, Crimson Peak, is not a horror film. Even if one had not read any of the multitude of interviews where he had said so, it would be clear because his heroine, Edith Cushing (Mia Wasikowska) is a would-be writer of ghost stories that aren’t ghost stories. As she says early in the film, they’re just “stories with ghosts in them” where “the ghosts are a metaphor for the past.” In the hands of a lesser director, dialogue such as this would be a hopelessly ham-handed move, a filmmaker tipping his cards because he doesn’t trust his audience. In the hands of a master, as del Toro is, they are a statement of purpose, a thesis laid out before being subsequently proven. Edith is an American society girl who meets and falls in love with British mining baron Thomas Sharpe (Tom Hiddleston), over the protests of her father (Jim Beaver) and a love-struck friend (Charlie Hunnam). She weds Sharpe before she sees the chilling mansion where she shall live, before she understands that there is more to Sharpe and his sister Lucille (Jessica Chastain) than meets the eye, and before she meets the ghosts who haunt the mansion’s chilly hallways. Jane Austen and Mary Wollstonecraft Shelley are name-dropped as authors whom Edith must choose between for her career, but as the mystery at Crimson Peak deepens, it’s more accurate to say that she is an Austen character who has found her way into a Shelley novel. Del Toro insists that he has delivered a “Gothic romance,” which implies far more than just “a love story with ghosts.” For one thing, it implies true love mixed in with true horror. The love story between Edith and Thomas is not given short shrift, as might happen in a lazier film; it is in fact pivotal to the film’s success. The scene in which he woos her by offering a lesson in the waltz is as romantic and elegant as anything in a major-studio film this year, and with that groundwork laid, it’s easy to see why Edith would stay with him even as the horrors escalate. There’s no secret as to where that horror originates — from their first appearance together, Thomas and Lucille share furtive glances and dialogue which fairly screams, “We’re the villains!” — but that, too, is by design. Modern horror films have so inured us to ghosts that are malevolent and/or demonic that we forget the lessons taught by the classics: most tales of evil begin with human beings. An arrogant doctor and his hubris are the villains of Frankenstein, while the monster is just collateral damage. The evil in a gothic tale is not the supernatural thing itself, it is human weakness, and in this story that weakness is played wonderfully by Hiddleston. His Thomas is at once truly in love and truly damned, longing for an easy escape that no person in his position has ever had. He’s sympathetic, even well after it has become clear that he has done things which are unforgivable, and that contrast creates the most important dramatic moments in the film. Even considering that she has two Academy Award nominations and a Golden Globe to her name, Chastain’s performance is a revelation. It’s easy for performances in gothic stories to tend toward the outsized and hammy: Kenneth Branagh’s Victor Frankenstein comes to mind, or Louise Fletcher in the gothic-inflected Flowers in the Attic. Chastain takes a character which could go that big and keeps it perfectly under control, loading more menace into a single glance than in any of the film’s ghostly special effects. Lucille is not sympathetic in the same way Thomas is, but she’s an antagonist whose plight can be understood, at the mercy of fate as much as her own choices. If there’s one flaw to Crimson Peak, it’s that Wasikowska and Hunnam can’t quite match such inspired work from Hiddleston and Chastain. Wasikowska puts in considerable effort, and there’s a lot to be said for her character as a strong woman, but she just doesn’t make her performance look as easy as Hiddleston and Chastain do when they’re opposite her. She’s trying too hard to do that which Hiddleston’s expressive eyes seem to be doing on instinct. Hunnam’s problem is that his role is more of a plot point than a character; he’s not doing much, but it’s doubtful that any man in Hollywood could do better. Above it all there is del Toro’s camera, always placed perfectly and never moving at a time when it doesn’t need to. The scares are not mere jump-scares, as the real horror is crafted around the idea that Edith is seeing something unspeakable, a horror that no person would be ready to confront, cloistered upbringing or no. The violence is gory in a way which is not titillating or exploitative but necessary, for establishing horrors which are to come. In del Toro’s hands the Crimson Peak mansion seems like it is too big and too small at the same time, a place where one can be trapped despite its dozens of rooms, and be free despite sharing it with two other people. Del Toro is right: Crimson Peak isn’t a horror film, not in an era when “horror” is all too often synonymous with “slasher” or “monster.” It’s a love story in which love can be a terrifying or damning thing, as much as it can be passionate or inspiring. It’s a story which isn’t simply improved by quality acting, but which demands virtuoso performances, which are then coaxed from superior actors. It’s gorgeous and moody and yes, frightening when it needs to be. It’s as ambitious a picture as was made this year, and all the better for it.